Collects All-New X-Men (2015) #12-16. One is a time-displaced, cosmically powered mutant. The other is a homicidal clone struggling to fulfill her dead mentor’s legacy. But who says two crazy kids like Angel and Wolverine can’t make their relationship work? Meanwhile, another romance will put one member at odds with the rest of the team! The X-Men spend so much time worrying about hate and fear—but love sure hurts, too! So does the Terrigen Mist — so much so that it spells doom for their entire species! But can the same be said for Genesis? Will he continue to fight his destiny as the maniacal villain Apocalypse — or surrender to it? 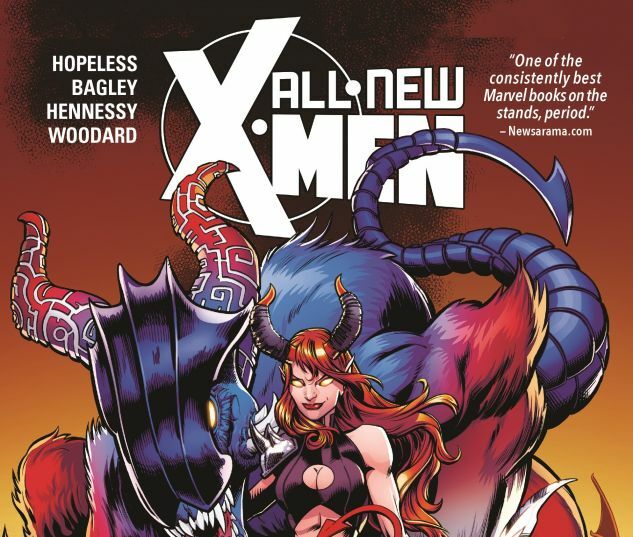 Plus: A wheelchair-bound Cyclops plays out his own version of Rear Window with a suspicious-looking Beast, and the Goblin Queen’s return forces the team members to confront their demons — literally!